Yes, its true, after all these years on the river I still find new runs. Knowing the river at every flow in every season really makes it about a half dozen rivers, maybe more. Fun to try new things, fun to see that this river hasn't come close to giving up all her secrets. Amazing to think that there are still so many places fish hide that never get touched. I am humbled every time I set foot on her shores. The water is fast and pushy, testing my wading skills to the maximum. Several times I look longingly toward shore not fully sure of the task at hand. Past the point of no return, I am committed now and I stagger on. Water is flowing hard around me waist deep, pulling me and pushing me. My feet slide crazily across shelf rock and thankfully grab hold. I walk the tightrope between control and foolishness. A dangerous chute waits far below me, taunting me, haunting me with the possibilities should I make a mistake. I usually don't get scared much on the river anymore, mostly because I don't put myself in the position to be scared. But, I am scared now and it feels good. Its a healthy and respectful kind of scared. All of the sudden, I feel like a kid again, a major dose of adrenalin spikes through my veins. I spy my path through the current and lunge for the high spot that will put me in a position to cast. My cleats dig hard as I lean into the small wave train and find purchase in the nick of time. I have made it! Now what? It doesn't look nearly as good now that I am here. Why oh why do I do this? What I thought would be a slower inside seam races along, really too fast for a good swing. I scan the water looking for tell tale signs of a dish, a piece of structure, a flat spot, anything. I see a flat spot down in the run, near the limit of my cast. It's not much, but if there is a fish anywhere in here he will be there. I start to cast and swing. I am throwing a big upstream mend and pointing the rod straight out in front of me, even a bit upstream to try and slow the fly down a little. Very slowly dropping the rod and following the fly after the mend, really reaching out there. The swings are fast but as I near the flat spot I saw earlier, I find a 20ft wide slot that starts to feel pretty good. Its a narrow swath but the swings are slower. I am maxed on my cast so I start to slip line into the drift trying to reach that flat spot and keep the fly swinging slow. After several drifts slipping a few feet of line in each time I am at my limit. With the extra line slipping, I am fishing my fly over a hundred feet away from me now. I make one more drift and the fly line catches some puffs in the current and does not respond to the mend that I try to put in. The fly is smoking through the sweet spot, much faster than I like. I hang on and hope and am met with a vicious take, the big buck coming out of the water instantly as my fly was probably cruising at about a foot under the water. The take came the only place it could have. The little flat spot at the limit of my wading and casting ability. I could never have anticipated how the fish would respond to a fly with that much pace. He liked it and so did I! A new fish in a new place, what could be better? Ezekiel 36:26- And I will give you a new heart, and a new spirit I will put within you. And I will remove the heart of stone from your flesh and give you a heart of flesh. 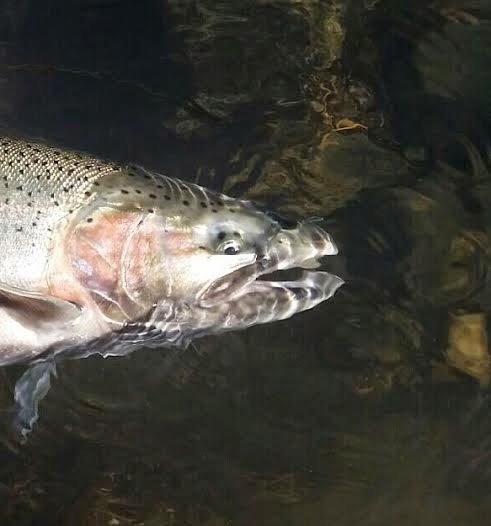 Great story of finding some new water and pulling a fish out of a tough spot! I need some of your hunting skills. Awesome writing brother, you told the story so well. Wicked nice Mark, Reading that story made me feel like I was right there with you. By the way last week was a great week fishing with you, Even though I didn't hook up every day it was one of the best times I have spent on a beautiful river. I believe ,,,,just enjoying the creation of such a beautiful river is a huge part of the fishing experience....Thanks again for everything and a great time..